TIP! - How to calculate ROI in the real world? newsinspirationTIP! - How to calculate ROI in the real world? 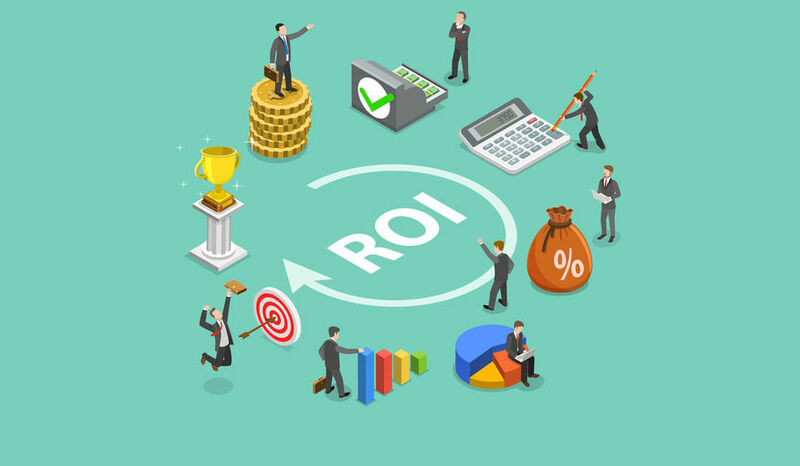 ROI is the profit, benefit or return resulting from your event, expressed as a percentage of its total cost. But how does this work in the real world? For a commercial company created value can easily be expressed in terms of financial gain. This is less easy for an organisation or association. Even so, it is still possible to calculate the ROI for sponsors or the impact of your event on others. For example, the introduction at a medical congress of a new and cheaper form of treatment for cancer patients will have a positive impact on the expenditure of health care organisations. The highest level (ROI, level 5) has already been described above. The next level (impact, level 4) indicates your success or otherwise in terms of actual value creation. If the purpose of your event was to increase sales, this impact will be equivalent to the real conversion in terms of sales; in other words, an increase in turnover. Level 3 deals with objectives relating to desired behaviour; the behaviour you want to encourage to achieve your desired level of impact. This behaviour might be a simple request for information, such as downloading a brochure, or the greater use of recyclable material for an MVO (socially responsible enterprise) congress. Or perhaps you want your event participants to NOT do something; for example, not to spend money unless absolutely necessary within the framework of a cost-cutting exercise. You have read in an earlier chapter how you can formulate these objectives in a SMART manner. Level 2 covers the learnings (or educational requirements): what do you need to give your participants to bring about the change in their behaviour you want to achieve? This might simply mean passing on information or knowledge, but it could also be the teaching of particular skills. Level 1 is all about satisfaction. What is necessary to make your participants feel comfortable or happy? How can you create the right environment to ensure that your learnings have the best possible effect? These elements can range from the self-evident room, decoration, catering, etc. to the less immediately obvious temperature, thematic development of your programme, etc. Level 0 is where we find your target group. This is the lowest level, but does not mean that it is the least important. Far from it! Further in this chapter I will look more closely at the best way to determine your target group. For now, all you need to remember is that in order to increase the ROI of your event it is crucial to only invite people who are relevant for the higher levels of the pyramid. This might sound obvious, but you would be surprised how often this simple rule is overlooked. Sometimes we invite people simply because we know them and so we think that they ought to be there, even if we are aware in advance that their contribution to the ROI will be negligible. Before you start using this model, it is therefore very important to evaluate and categorise your different stakeholders (participants, speakers, sponsors, etc.). 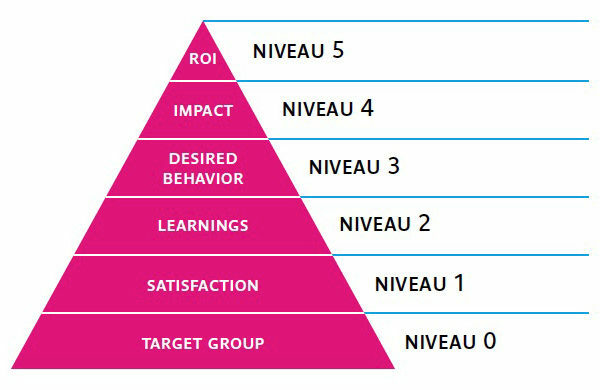 For each of these target groups you can then formulate objectives for each level of the ROI pyramid, working from the top downwards (levels 5, 4, 3, 2, 1, 0), so that after your event you can measure results on the basis of the formulated objectives, working from the bottom upwards. In order to be able to measure meaningfully, it is important to try and isolate (as far as possible) the effects you wish to achieve from other environmental influences. For example, make sure you don’t plan your event to coincide with a major advertising campaign. Because this will make it difficult to access which channel has helped to convince your customers. Of course, in many circumstance your advertisements and your event will 17 objectives and target group complement each other. And in some cases, it may be deliberate strategy to plan them at the same time. This is fine, but it is then probably better to measure the combined ROI of both elements. Working with a control group is another possibility. This might mean that you deliberately fail to invite part of your target group, so that after the event you can compare the (purchasing) behaviour of the absentees with the behaviour of those who were present. You have formulated an objective and are able to measure it. Great! Unfortunately, however, this does not yet mean that you have actually created value with your event. You only create value if you are able to change the patterns of behaviour amongst the participants. Consequently, you need to ask yourself what changes you want to see and in whom. To define the creation of value, I can do no better than to borrow the wise words of Rob Captijn, one of the leading advocates of ROI for events. He refers to the story of the supermarkets, which on the basis of various studies and scientific research projects have learnt how to influence the buying behaviour of their consumers, so that they often end up at the check-out with far more purchases in their shopping trolley than they had originally intended. And what the supermarkets do with the strategic placing of products and special offers, you can also do with your event, by making the best possible use of light, music, decoration, catering, etc. It is not enough simply to book a few entertaining acts on the basis of your own gut feeling and then trust to luck that this will have the desired effect on your participants. No, you have to persuade them by a well-considered strategy, based on a combination of elements, to actually change their behaviour. You want to turn their 'no' into a 'yes'. Sense of urgency. Your target group needs to recognise the urgency of the need for change. Otherwise, there will be no stimulus to persuade them to request more information or make a purchase after the event has taken place. Relevant arguments. If you have identified your target group correctly and have a good idea of what they think about your objective, it should be possible to develop convincing arguments that will help you to bridge the gap between ‘no’ and ‘yes’. This is the reason why ‘storytelling’ must be an indispensible part of any (commercial) event. By the careful stage-managing and programming of your events (carefully chosen, speakers, acts, content, etc. ), you can have a real influence on your participants’ patterns of behaviour. An event is the only marketing channel that can play on all the senses of your target group at the same time. If you make efficient use of this opportunity, you can communicate with power and conviction. It is not without good reason that 'experiencing' is nowadays central to the organisation of any event. Activation. All the positive work that you have done during your event will come to nothing unless you have an effective way to activate your target group once the event is over. This means that you need to find a way that makes it easy for them to say ‘yes’. Perhaps you can do this by giving them an order form to take home, or alternatively you can ask for feedback at the end of the event. These are the kinds of action, if properly implemented, which will also make your ROI measurable. The creation of value does not take place exclusively during the event itself. You need to adopt the same consistent line of approach during both the invitation and follow-up phases. For example, using the right media, design and content for your event website can be vital in setting the right tone. Similarly, during registration on the day of the event you can ask for the additional information you need to further refine and focus your story. And afterwards you can spread photos via social media to try and convince the last few remaining doubters. Focus your efforts on those elements within the target group who you think can most easily be influenced to change. In other words, the ones for whom you need to make the least effort to obtain a positive result. This will produce maximum effect at minimum cost, and with fewest disappointments. It also leaves room in your budget to do a little bit extra for those really hard nuts to crack. Want to hear the ROI story from Rob Captijn himself? Make sure to check this eventplanner.tv video on ROI.